Wait or make an impact? So often you hear people lamenting that "nothing ever gets done in D.C. anymore!" Do we use the lack of productivity in others as an excuse to not work as hard on some of our own agendas? Do we think since ESEA can't seem to be reauthorized that we might as well not even worry about IDEA? Do we wait or do we continue to work at making an impact? CASE votes to continue to work. When did this "vote" take place? You don't remember getting that ballot? No, there wasn't a vote but you know that is has happened because of the ongoing work of all the CASE committees. All CASE members in good standing should have received their July, August, September IN CASE Newsletter on Thursday, Sept. 12. If you did not receive the electronic link, you can "pick up" your copy behind the Members Only section of the CASE website. From the President's article on page 1 to the C3 CASE Committee Corner articles page 10-15 and beyond, you can see the work of your organization. At the annual Fall CASE Board of Directors meeting, Sept. 25-25 in Indianapolis, representatives from all of the state and provincial units will be involved in discussions on ESEA, IDEA and other critical issues. Discussions on just what CASE should be promoting on these topics for the next year. It is important for us to move forward maybe even more important that we move forward when others are standing still. As I mentioned in last week's article, those attending the CASE annual conference will also have an opportunity to "weigh in" on the critical topics of the field through the CASE Cracker Barrel sessions. Watch for the write ups of these discussions. If you are not a member of CASE, now is the best time to be sure you join so your voice can be heard as CASE makes an impact on the field. Are greatly opposed to public funds being used for private school vouchers. 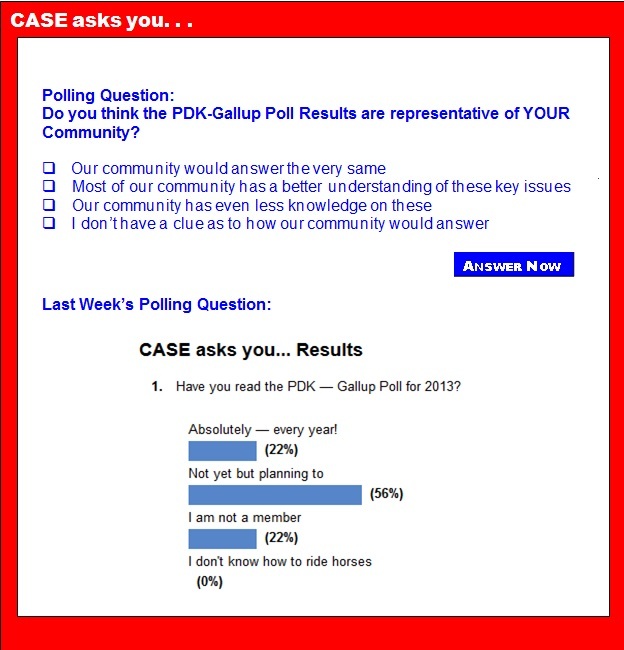 Click here for the news release, click here for the poll highlights, and click here for a report on the data. Think about these results and what you, what your state unit, and what CASE can or should do about these results. Though this annual poll is on U.S. education, I think there are important implications to our members/colleagues to the North and elsewhere. What do you think ... should we wait or make an impact? PS ... One way to make an impact is to volunteer for a CEC Committee ... see the article below: "Be a leader — 2014 CEC Committee Leadership Opportunities" and follow the link! Do you have leadership potential? Make a difference and volunteer for a CEC committee that relates to your interests and expertise. CEC members interested in applying for upcoming vacancies on these seven committees should complete the Committee Interest Form. CEC members interested in applying for upcoming vacancies on this committee should complete the Nominations Standing Committee Interest Form. Student members interested in applying for a position on the CEC Student Committee should complete a Student Committee Interest Form. You can help shape the direction of your professional organization and lend your expertise to CEC's work to advance the field. Apply today! *Activity of the Diversity Committee has been suspended for 2013 pending completion of the Diversity Workgroup report. However, applications are being accepted for 2014. Just like a patient expects a doctor to have completed medical training, the public expects 'highly qualified teachers' to have completed their preparation program. But this is not the case. The House Education and Workforce Committee held a hearing to learn more about the Institute for Education Sciences, the research arm of the U.S. Department of Education, to inform the reauthorization — rewrite — of the Education Sciences Reform Act. What was revealed will come as no big surprise to educators and researchers alike: IES has increased the rigor of education research but is challenged by poor dissemination. With the start of the new school year, teachers are preparing themselves for the repercussions of sequestration cuts to education. Sequestration — the federal government's initiative which stripped over $600 million from early intervention and special education programs across the nation and was opposed by CEC — has greatly affected school districts around the country, particularly those with a high proportion of low-income students. Parents' goals for treating their child's attention-deficit hyperactivity disorder tend to steer the treatment in a distinct direction, new research shows. When parents' main concern was their child's academic performance, they often chose medications as the treatment of choice, but if parents were more worried about their child's behavior they tended to opt for behavioral therapy as an initial treatment. Just a few steps away from a Piccadilly restaurant, Sarah Reling is working with her second-graders in a new kind of public school. "So you have a vowel, two consonants and a silent 'e,'" Reling said. "Is that vowel long or short?" The lesson is part of a daily, intense focus on reading at the Louisiana Key Academy, a just-opened charter school that caters to children from kindergarten through second grade with dyslexia. When D.C. students discovered that recess had been cut to a minimum of 15 minutes per day, many parents launched an immediate protest. Others merely shrugged. "Teachers should be teaching. Students should be learning," wrote Steve Sweeney, a parent at Tyler Elementary on Capitol Hill, whose three daughters told him that recess was no more than a chunk of unstructured social time in the middle of the day. But research released this spring showed that recess — when it's well-organized — can make a real difference in schools, resulting in students who feel safer, bully less and are more ready to learn. For years, the growth in the number of children with attention deficit hyperactivity disorder has prompted skeptics to ask whether the condition is over-diagnosed. Couldn’t some of the nearly one in 10 adolescents diagnosed in the United States just be more rambunctious than their classmates? Or are some simply immature for their grade, as one 2010 study suggested? And why do some kids appear to outgrow ADHD with age? Without a single medical test to prove otherwise, the uncertainty surrounding the disorder — and the drugs needed to control it — has been hard to quiet. While his eighth-grade classmates took state standardized tests this spring, Tucker Richardson woke up late and played basketball in his Delaware Township driveway. Tucker's parents, Wendy and Will, are part of a small but growing number of parents nationwide who are ensuring their children do not participate in standardized testing. They are opposed to the practice for myriad reasons, including the stress they believe it brings on young students, discomfort with tests being used to gauge teacher performance, fear that corporate influence is overriding education and concern that test prep is narrowing curricula down to the minimum needed to pass an exam. Developing strategies to help elementary students with the most severe learning disabilities is the focus of a new research project to be based at Vanderbilt University in Nashville, Tenn. The National Center for Special Education Research awarded a 5-year, $10 million grant to the university to create an "Accelerated Academic Achievement Research Center." Between 2,000 and 3,000 students in Nashville schools will participate in the research. Doug Fuchs, a professor of special education and the grant's principal investigator, said in an interview that the academic performance of students with disabilities continues to be poor, even with a move toward inclusion and instructional strategies such as response to intervention. The superintendent of the Lancaster, Pa., school district is meeting with teachers and staff at George Washington Elementary. It's the start of a new school year, and he's trying to sound upbeat about the district's finances. "We continue to lose 5 and 10 percent of budgets each year," Pedro Rivera tells them. "And our overall goal is to make those plans and stretch out dollars to not impact you, because no kids should go without. Right?" Applause is polite but scattered, and Rivera's question hangs in the air. Employees here know the superintendent can't protect kids from the cuts the district is having to make. Schools have a special responsibility to provide continuity when students with disabilities move from one district to another, federal education officials say. In a letter to state directors of special education this summer, officials from the U.S. Department of Education clarified that schools have a duty under the Individuals with Disabilities Education Act to provide comparable services to "highly mobile" students as they move between districts. This group includes kids from military families, those in foster care as well as migrants and children who are homeless, among others who move often, the department said. Will new Common Core Standards mean less teaching to the test? One of the big questions as Florida and 44 other states transition to new education standards and new tests over the next few years is how much time will teachers have to spend teaching to the test? Teachers complain that they can only spend classroom time on items which will appear on the Florida Comprehensive Assessment Test. In addition, another complaint is that class time is used to teach kids how to take a test rather than imparting more important knowledge. 1.2 million children in the U.K. have dyslexia, a print disability where students have difficulty reading and interpreting meaning. For them, though words are visible, they may swim or dance on the page and this can seriously affect their studies and performance. But with the right support from their teachers and the use of technology, simple changes can make a big difference. What if you only had 5 minutes to inspire a student? First impressions are important. We know this. We've heard about it in commercials and read about it in books. The statement, "You don't get a second chance to make a first impression," is a popular statement that is ingrained in our psyche. As much as we often think this only means adult-to-adult relationships, it also pertains to the relationships we have with our students. Aligning instruction to meet the Common Core State Standards is the new norm for educators across most of the United States. In the middle school math classroom, technology can be used to help students reach mastery of these Common Core skills. Let's take a look at a sixth grade geometry standard and how, using technology, teachers can promote engagement through student-centered exploration of this skill. A new focus on technology could be helping Kings County special education students learn better and increase interest in class. With more and more school districts making iPads, computers and other devices available to students for class use, teachers and special education students have more control than ever on how and what they learn. According to some local teachers, the devices have helped students' writing and communication skills as well as got them more interested in coming to class. Teachers, especially those in lower grades, for years have sent home notes encouraging parents to practice flash cards with their youngsters and to read for 20 minutes a day. These days, there's an app for that. Some schools and teachers have begun recommending educational apps and websites for families to use at home. They believe the technology, and the tools that come with it, help draw kids deeper into lessons.